I’ve only been using Firefox for two months and made the change primarily because of it’s enhanced security and great plugins. Somewhere along the way, being the sometimes-technologically-challenged person I am, I changed a setting that caused my downloaded files to be saved when I wanted them to be opened. And I was amazed. Firefox has two things going for it: great product and great customer service. Not going to go into the debate of which is better, but it’s important to have both. Before you start thinking “Sure, great for companies like Firefox or Microsoft whose users are right in front of Twitter”, but what if your company could jump in and respond to these questions? Why does my [insert brand] printer keep printing it’s test page? The list goes on. There’s some commentary on how the vast majority of Twitter users talk about frivolous things. That may annoy some, but to companies, it’s an opportunity to jump in, join the conversation and make a positive difference the same way Firefox did for me today. Do You Really Know Who You’re Following On Twitter? I’m in the midst of revising my Twitter guides and got a little inspired by Chris Brogan’s “Reading and Commenting” day (which is tomorrow, by the way). How many people do you follow on Twitter? How many of them do you actually know? Do you know what their interests, passions and niches are? When was the last time you sent them something meaningful or of value, instead of the usual noise? So here’s what I’m proposing: This week during your small pockets of time, go through the list of people you’re following and figure out how you can add value as a Twitter friend. Maybe it’s commenting on their blog, subscribing to their blog, or sending them a link relevant to them. Because really, at the end of the day it’s not how many people you follow, but your relationships with them. 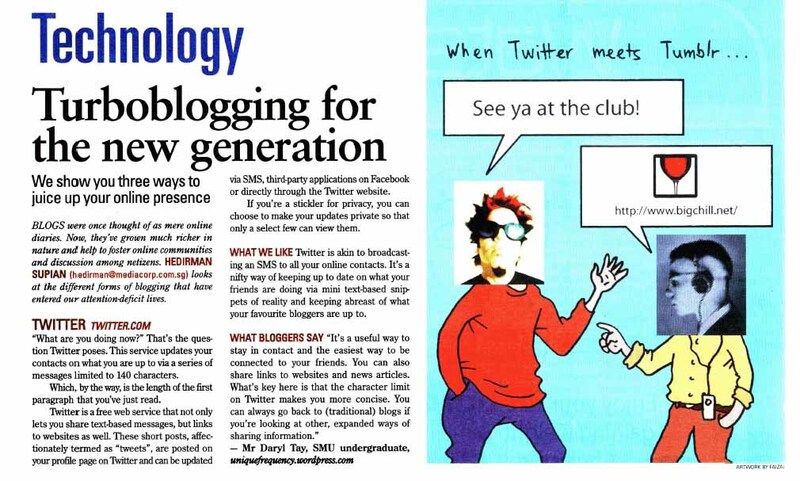 Quoted In Today Newspaper On Twitter! The article’s out today! I thought it’s pretty good. Hopefully more people will read it and get onto Twitter. All the financial worries plus the recent downtime over the weekend and Twitter’s lead architect leaving makes for a slightly worrying future for Twitter. Here’s hoping they can pull their act together soon. After what happened last week, I was quite pleasantly surprised to get a very considerate sms from a reporter this morning, saying he was concerned about disrupting me and asking for a good time for him to contact me. He knew who I was, definitely had read my blog and referenced things I said in context both on my blog, Twitter and at the IDC Conference. He had clear questions and obviously had done research on the topic. Again, it’s not that I’m some big shot in the space, it’s just the other party being nice and well…. a human. Not just someone digging for information or a soundbyte. Unlike the previous two reporters, if this particular journalist asks me in future to recommend him a blogger in a different niche, say food or technology, I will definitely be more than happy to do so because I know he will treat that person with courtesy and respect that I think anyone should get. Here’s hoping more journalists learn from these experiences. What Would Life Be Without Twitter? I’m a huge fan of Twitter, but it’s been wonky since Saturday and today it just got too much. My friend Jack Hodgson is convinced that Twitter’s death is coming, and that we should start preparing for it now. It’s nights like tonight that I really think he’s onto something. What? Twitter’s death? Life without Twitter? No way! Death or no death, people around the blogosphere are beginning to notice. Dan York also weighs in on how we have come to rely on Twitter, while Frederic and Paris Lemon approach the issue the same way I do. For the tool that enables conversation and for people to stay connected, Twitter sure isn’t communicating much about what is going wrong. It does make you think how this affects organisations who have invested time into Twitter like @downingstreet (for the British Prime Minister’s office) and @deltaairlines as a means of keeping in touch with the public? A loss of faith in Twitter? Migration to another platform? If Twitter does go down, who will you turn to? Scoble thinks it’s FriendFeed. I’d go for Facebook Chat, if only they’d implement it for me already. Why Generation Y Doesn’t Read The Newspaper And Can They Do Anything? At the IDC Conference, Directions yesterday, I said Generation Y doesn’t read the newspaper. And MediaSlut picked up on it asking what newspapers can do in response. Coincidentally, Today ran an article today about the state of Singapore’s journalism. I did not mean to say that my generation doesn’t read news. I think we do. Just not the papers. The question at the panel was whether online is the new “it” in media, and coming from a communications standpoint, of course it is. Is there another medium that has more messages sent and received than online? We don’t spend half an hour thumbing through the papers in the morning, we’re reading the latest Harry Potter in e-book format on the train. We don’t spend 3 hours a night watching tv after coming home. We’re watching tv online, chatting to people, working on homework and maybe even playing a game. In an advertising class I was once told “think about where your consumers spend their time”. I spend 75% of my waking hours online. That pretty much guarantees that if your message is restricted to traditional media, I’m not going to see it. I know MediaSlut isn’t asking me about why I don’t read the papers. But I feel you have to understand that to move forward. Some are more specific to me, some are general for Generation Y. 1) News finds me. I don’t mean it’s offered to me on a platter, but that if it’s a particularly relevant piece of news, someone is going to blog about it, send me an email with an URL attached or just tell me about it on MSN. 2) I need my information to be relevant. Let’s say I can read 10 articles a day. These 10 need to be relative to me (ie marketing or communications related). Reading 10 articles in my niche adds much more value that reading 10 articles (or more) about unrelated happenings in the world. Put another way, an economist is going to find relevant articles about changing interest rates or inflation much more valuable than the latest way to use Twitter. And vice versa for me. So to either the economist or myself, it makes more sense to subscribe to a blog or someone who talks about that niche or to just Google “changing interest rates today”, as opposed to flipping through 10 pages of unrelated text. 3) Papers are slow. It’s not their fault, I know. Papers are published daily, not hourly, I get that. But explain to me how I hear about an Outram MRT shooting via Twitter, check out the CNA website and it’s not there? Yes I know CNA’s Twitter mentioned it, but sorry, dead man found at Outram MRT is not the same as man shot at Outram MRT. 4) Gen Y wants different things. I have no empirical evidence for this, but a communications professor told me once in school that what the newspapers publishes and considers “news”, is not what the public wants to read and considers “news”. He was comparing the front page of Digg to the front page of any newspaper. I think there’s some truth in there. How much, I don’t know. But one of my RSS feeds is to del.icio.us’s front page, and not that of the Straits Times. So what can print do? In all honesty, I don’t have the answer. I cannot think of something, that if present, would make me read the papers. But here are a couple of minor suggestions. 1) Speed. If I read about it on Twitter, please have it on the CNA website so I can verify that it’s true and read the truth. 2) Accuracy. If you can’t be fast, at least be accurate. If a man was shot, please say he was shot, not just “dead”. Shootings don’t happen every day in Singapore, post the tweet 3 minutes later if you have to, but make it representative. 3) Convince me of your value. Unrelated sources commenting on unrelated topics? Sorry, not buying it. 4) Be accessible. If I Google something and it directs me to a Straits Times link which then asks me to be a subscriber (free or otherwise), that’s it. I close the window and move on. 5) Be human. I wanted to present on this at Pecha Kucha night. Traditionally, journalists were immense gatekeepers of the media. I’m sorry to say that’s not it anymore. Maybe that explains my interviews yesterday. I’m “just another peon” to be interviewed by the venerated gatekeepers, and the peon should be honoured to have his name in the press. Sorry, doesn’t work that way. Does MSM still have a place? I think it does. As much as I’m a social media advocate, some things just don’t fly. I always use this as an example: NTUC (or Wal Mart) needs newspapers. That’s where their “aunties” find out about the deals and coupon clippings. I understand that. As long as this demand is there, MSM will have it’s place. I’m going to come back to the point I was trying to make at Directions. This demand is not there for my generation. We don’t interact with MSM the same way people 10 years older do. If you sit up there looking at your old model and think “Oh it’s your loss, you ignorant younger generation”, I think you’re very mistaken. As I mentioned, I can think of nothing that newspapers can do to make me turn back to print. The question is what can you do to engage me online? Hint: subscription isn’t the way. Incidentally, the issue of censorship of non-freedom of the press etc isn’t an issue for me. I know how Singapore works and that’s fine. Just make up for it in other areas. Make ourselves heard? No. How about newspapers make yourselves heard and engage us instead? The biggest threat to newspapers is not that we think they’re substandard. The biggest threat is if we’re indifferent to them and don’t notice either way. And I guarantee you it’s easier to click that little “x” on my Firefox browser and switch to an alternative source online, than to write an email to the editor to make myself heard. Yes, look beyond the readership figures, but I think it’s presumptuous to write as if the corporation’s ad spend options are between newspaper and newspaper. If I were to remove my ad spend from newspapers, they’re moving somewhere else entirely. If I were to move advertising to a medium with “premium brand names held in high regard”, maybe something like CNet would be a better option than Digital Life. These are my thoughts. I don’t speak for the whole of Generation Y, and I’m sure there are many people who will take opposing views, so let’s hear them! Comment away! Quick Thoughts On The IDC Panel Discussion, And I Want Yours Too. Haven’t had time to really get online after the IDC Conference, because of a night out with my two closest friends Rubin and Reuben with some grown up talk (jobs and marriage). But I really wanted to squeeze out a real quick post on today’s IDC Panel discussion and give you a sense of what I’ll be talking about over the next couple of days. First, a big thank you to @litford, @byzantin3 and @ridz84 for watching the live webcast and sending me nice messages on Twitter. I’m sorry I didn’t reply because I switched off Twitter on my phone for the day. Didn’t want to be distracted while on stage. Again, thank you for taking 45 minutes off your busy lives to hear what I had to say! Second, an even bigger thank you to Geek Goddess Estee for coming down in person to support me there and for passing me a book on New Media. Can’t wait to read it! I’m going to mention @litford twice because he has a recap of the topics and questions and answers on his blog as well as posting the live feed. If you missed it, check out the discussion over there. Next, I have 5 points that I’m going to blog about in detail over the next few days, but I want to throw them out here first. Again, Brian has talked about this in his thoughts from the panel. I was listening to a podcast on the way home and coincidentally it serves as a great case study for how to do advertising/sponsorship in the blogosphere. It’s a North American example, but I think it applies pretty well. 2) On Gen Y not reading the newspapers. MediaSlut as always has started a very good conversation about how this may be worrying. I was told from Debbie that @ridz84 agreed on the live chat with me that most of us don’t read the papers, and before I respond to MediaSlut, I’d like to take a straw poll just to give an indication if I am guilty of a gross generalisation, or if there’s some truth to it. I think this came up as a common underlying thread between all the panelists. How important is trust between you and a blogger? Does it even matter? Or is it just another one of the many, many fragmented voices online and there’s no differentiation? I had the great fortune of meeting two brilliant people from HP who I could share my huge enthusiasm for Snapfish with as well as talk about the HP Mini-Note a little bit. Very smart people who definitely realise the value of engaging in this space and meeting them in person convinced me that they’re not just doing it because someone at corporate or their PR company said to do so. From talking to them I could tell that they truly believed it was a worthwhile endeavor and that’s the reason why they are doing it. At the same time I had a couple of crappy experiences today too which I’m not sure I want to talk about in detail, but at the very least I will mention vaguely. I am genuinely, genuinely curious about whether companies are interested in social media/new media/web2.0/whatever as an option right now, (which is already too late). Or if they think this is going to be another fad that will pass through in a year. The reason why I ask this is because I think one big issue, corporate blogging, was brought up today, but it didn’t seem to generate much discussion after the panel. The other thing which is a smaller issue, was that we ended the panel on a note about microblogging, specifically Twitter. I’m sure companies in the audience could benefit from such a quick-action response mechanism, but again I’m not sure that was a conversation that was going on after the panel. I just want to say I don’t mention #5 because I think they should be talking to me about these issues. I don’t claim to be the best person for them to talk to because after all, I’m still a student observing all of this from the comfort of the university. But is this conversation happening at all? All in all, today was really great for me. I would’ve liked to have heard some questions from the floor and hear some of the real questions and concerns that companies have when thinking about engaging in this new space that is changing so rapidly, but unfortunately we didn’t have enough time. Was probably good that they timed us though because I think we could’ve gone on till tomorrow with no problem at all. Well those are my quick thoughts on today’s discussion. If you have any please feel free to chime at the comments below, or if you like, drop me an email at uniquefrequency[AT]gmail[DOT]com.